Cheaper, bigger, and hopefully better. 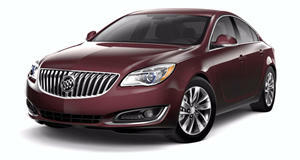 Buick is clearly on a roll these days. It has just unveiled its all-new 310 hp AWD Regal GS (arguably the best Buick since the Grand National), and now it’s just released official pricing for both the standard Regal sedan and wagon. The sedan, powered by a turbocharged 2.0-liter four cylinder, will begin at $25,915. Do the math and that’s more than $2,000 less than the current 2017 Regal, which starts at $28,385. That turbo four is certainly no slouch, delivering 250 hp and 360 lb-ft of torque. When equipped with AWD, torque increases to 390 lb-ft. These figures are a huge increase from the 2017 Regal’s paltry 182 hp and 172 lb-ft. What’s more, the Regal sedan is more than just a plain old sedan; it’s a Sportback, sort of a part-sedan, part-hatchback combo. Therefore, cargo space is also up by 14.2 cubic feet. And then there’s the new Regal wagon, called the TourX. It’s not exactly a crossover, but some might mistake it for one. Whatever you want to call it, the car carries a $4,000 price increase over the sedan, beginning at $29,995. Think of it as a more affordable alternative to the Audi A4 Allroad and Volvo V60 Cross Country. It is, however, slightly more expensive than its closest direct competitor, the Subaru Outback. The new Regal GS, as we already reported, begins at $39,990, but for that buyers receive standard AWD and the same V6 engine that also powers the Chevrolet Camaro. Now that Buick has unveiled the entire 2018 Regal lineup and its specs and pricing, it all comes across as quite a bargain. How they all drive and handle, however, remains to be seen.